Like any Makuta, Radayi started out as a benevolent member of the Brotherhood. As a master of trickery and deceipt, he would often amuse himself by play others for fun, a trait that allowed him to hone skills that made him exellent for the job as the Brotherhood’s head propagandist. He also learnt to become untouchable, always setting traps, using illusions or otherwise. Eventually he grew overconfident in his abilities. During his lifedawn he also claimed ownership to a prototype Bolt Launcher. 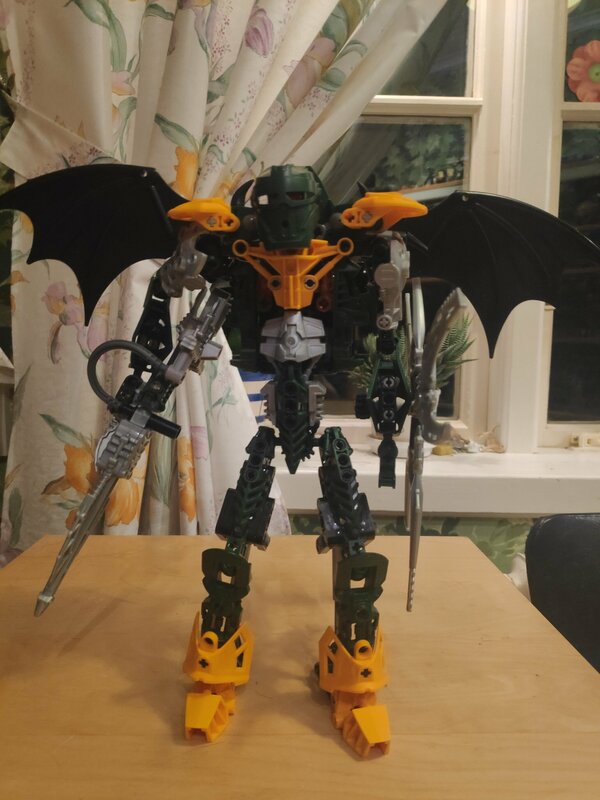 Tens of thousands of years later, Teridax’s propaganda had with time come to bore him however, and so he instead started ignoring his brothers more and more and turned his attention to ”playing” with the Matoran inhabitants of Zanua, testing his (most of the time, failed attempts at) Rahi, as well as other inventions on them, while spitting out lies and excuses and having his Toa Hagah make sure that the population survives for his next show. Radayi eventually started experimenting with his own Rahkshi to make them more powerful, however he lost control of the mutant Rahkshi, and they ran rampant on several of Zanua’s villages. 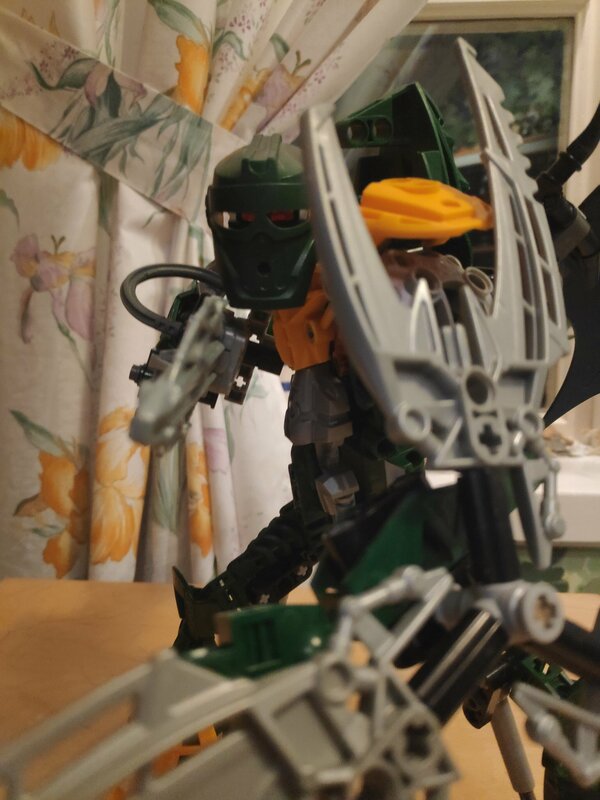 Despite their best efforts, his Toa Hagah, now more full of doubt in their Makuta than ever, were unable to stop them alone and only managed to trap them deep underground after joining up with a visiting team of Toa who had also encountered the Rahkshi. 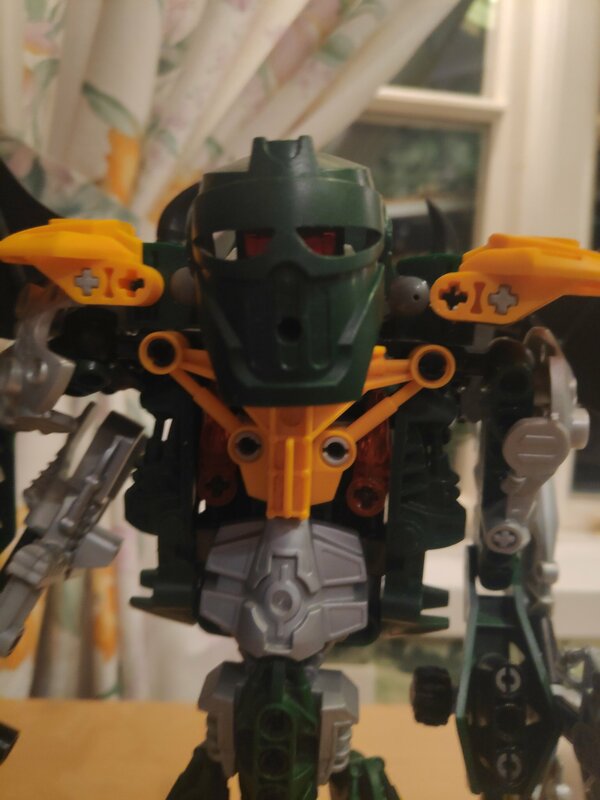 As the Makuta’s ignorance towards the Brotherhood continued to grow while they evolved into their gaseous form, the Matoran had grown tired of their watcher’s games, and started an uproar. His Toa Hagah, tired of his lies, turned against him as well, siding with the Matoran. He killed the majority of his Toa Hagah in a blazing battle, leaving one alive, and another mortally wounded. 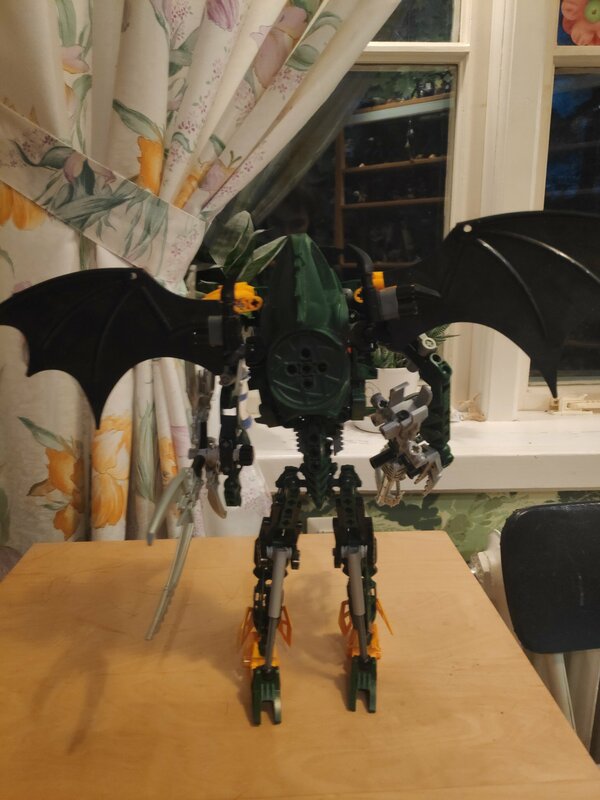 Not long there after, the Matoran hired a warrior member of Brutaka’s species to deal with the Makuta. 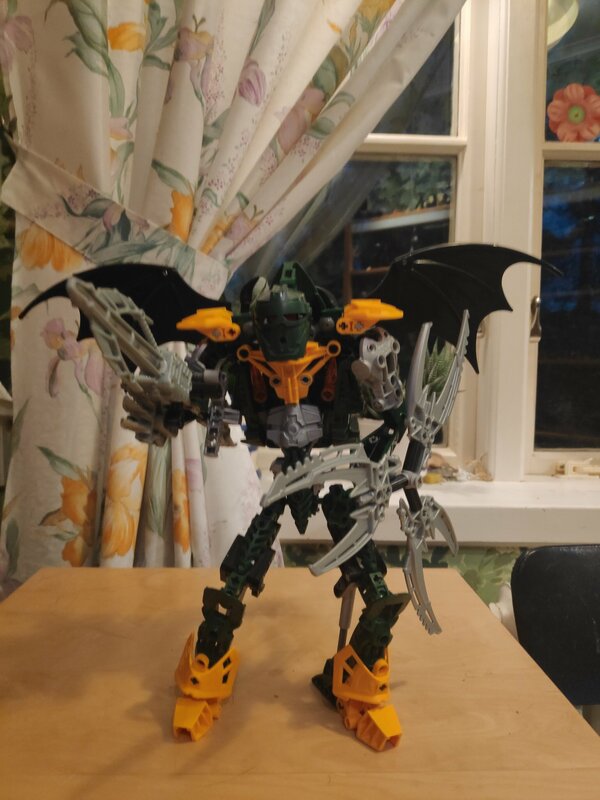 With the help of the surviving Hagah the Versuvian gathered various pieces of machinery created by Radayi to create an object capable of nullify his Kraata powers and sprung a trap for the Makuta. After an intense battle the pair managed to weaken and imprison the Makuta. A month later an attendant was sent to check on the Makuta and provide him with energy to ensure that he would not die, however all they found was an empty shell. 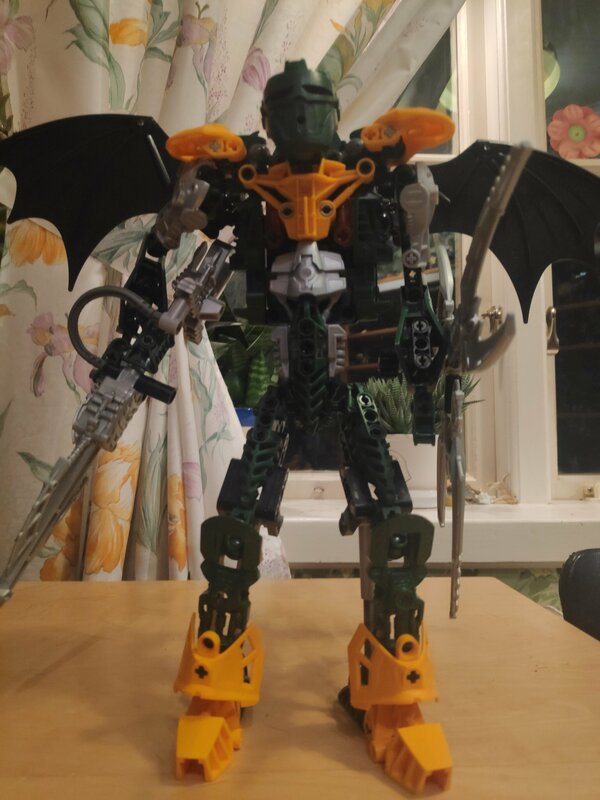 Radayi’s armor had been breached during the battle, and now all that remained was a husk of what had once been a Makuta. 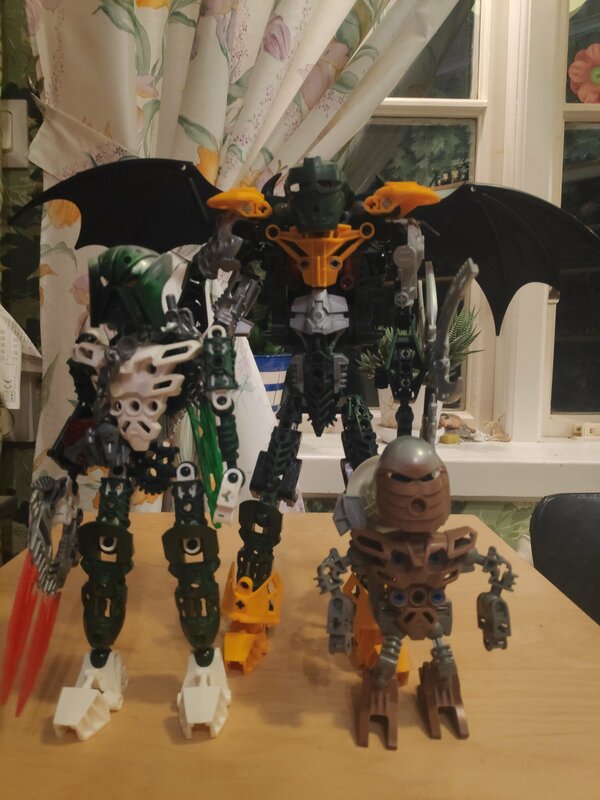 Toa Mukau (An RPG character of mine), Makuta Radayi and Ahkmou Hafu, for scale comparison. Radayi was a not what one would call a capable warrior, and relied heavily upon ranged attacks channeled through his Bolt Launcher. He was, however, a capable flier, and sometimes used his razor-sharp wings as weapons. Like all Makuta of the prime universe, he possessed 42 Kraata powers, as well as telepathy, Kaita dissolution, and elemental Shadow powers. He relies heavily on both the mental illusions granted by his Kraata powers and the optical illusions & voice imitations the Kanohi Mahiki grants him. I'll probably revisit this character in the future. Hopefully I will have obtained some more sets by then. Also, apologizies if there's tones of dust on this guy; he's been lying on my floor for two months. I'd like more keetorange, rest looks good. Certainly has a G1 feeling which is always a plus. Interesting colour scheme, although I'm personally not too much a fan of a mix of Keetorange and metru green. I'd have used more silver, and Keetorange only for accents. Upper legs look good, otherwise the limbs are a bit generic, like you said. Torso is alright, that Visorak head on the back looks a little out of place, though. Weapons are interesting, however. Otherwise we talked about this already and it works. I honestly have no idea how to do arms. Yeah, arms are a pain. MOC accepted, thanks for participating! Yes, lifedawn; whoops. Leafdawn is something else. True. They're as big as LEGO's wings get though. I'm not big on using fabric personally.